Banh Xeo: crispy coconut turmeric crepe with onion, bean sprouts and jicama, with your choice to add tofu and mushroom, chicken, pork, prawn or roast duck. 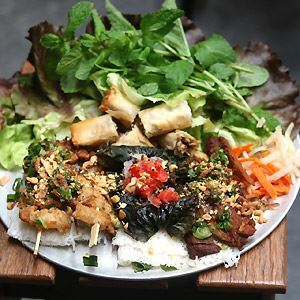 Tucked into Marrickville’s bustling streets is Hello Auntie restaurant, providing a trendy take on Asian cuisine from a venue on Illawarra Road. Steel pipes, exposed brick walls and low lighting create a stylish interior, with an industrial setting well suited to Sydneysiders looking to unwind with after-work drinks, graze over Vietnamese-influenced dishes and share good company. 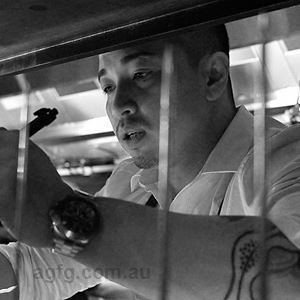 An array of tantalising flavours are featured in popular dishes, such as ‘Pho tai nam’ – Black Angus beef, brisket and rice noodles in a classic beef broth, or delve into small tapas-dishes from the likes of edamame tossed in fermented shrimp paste , spiced brine silken tofu with truffle artichoke puree and pickled heirloom radish to pork, chicken or King prawn skewers. Asian inspired desserts are also on offer. Wednesdays we do BYO wine! Great food, with amazing flavours and texture. Service is extremely attentive and well balance. Five stars from me!!! Ban Xo was tasty but it wasn't practical to eat with only a small amount of pork. In fact all the food was incredibly tasty although they all felt somewhat incomplete with just the need for another component. A tip to the owner if your going to charge $9 for a glass of wine serve it in a wine glass not a huge stemless wine goblet as we felt no value and it looked like 2 sips. Otherwise beautiful service which could potentially bring me back. Wonderful food! Fabulous service! Delicious and cake looks magnificent! Fantastic! Great food, best service ?????? 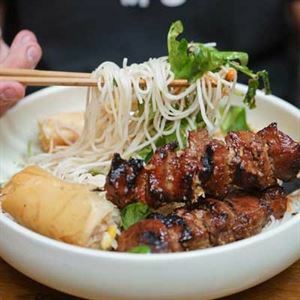 Fantastic trendy place to get the best modern Vietnamese in Sydney! Food was very modern mixed with traditional flavours.. Outstanding.. Service was wonderful! Loved it and will be back! My husband and I loved everything about Hello Auntie. The food was a taste sensation, lovely helpful staff and excellent service. It is a family friendly restaurant and exceptional in every way. We'll be back to try more on their delightful menu. By far the best Vietnamese restaurant we have been to, and we've been to MANY!!! The service, both front of house and floor staff, food and ambiance were 100% on point! Hubby and I went there tonight expecting something great...we walked out absolutely amazed! We ordered 6 dishes between the 2 of us (because everything on the menu sounded so delicious we couldn't decide) and every mouthful was sensational!! Stand out meals for us were definitely the twice cooked pork belly, the banh khot (coconut tumeric pikelets filled with sautéed prawns) cooked in traditional cast iron skillet and the pho. We've had pho in a lot of different restaurants but this was by far the best we've eaten in Australia! Staff are super friendly and very attentive. Very reasonably priced, good servings and most importantly absolutely great tasting food! We will definitely be back. If you haven't gone yet, please pay Hello Auntie a visit!! Awesome food, awesome atmosphere, great staff and real family friendly! A must try! Delicious food, Very Pleasant wait staff who were very friendly and strong knowledge in the menu. Decent Price on the meals. For those who didn't know, on Wednesdays we do BYO wine at Hello Auntie. So bring along your favourite wine to match Auntie's delicious creations!